From the perspective of an Earthling, outer space is a zone that occurs about 100 kilometers (60 miles) above the planet, where there is no appreciable air to breathe or to scatter light. In that area, blue gives way to black because oxygen molecules are not in enough abundance to make the sky blue. Further, space is a vacuum, meaning that sound cannot carry because molecules are not close enough together to transmit sound between them. That's not to say that space is empty, however. Gas, dust and other bits of matter float around "emptier" areas of the universe, while more crowded regions can host planets, stars and galaxies. No one knows exactly how big space is. The difficulty arises because of what we can see in our detectors. We measure long distances in space in "light-years," representing the distance it takes for light to travel in a year (roughly 5.8 trillion miles, or 9.3 trillion kilometers). From light that is visible in our telescopes, we have charted galaxies reaching almost as far back as the Big Bang, which is thought to have started our universe 13.7 billion years ago. 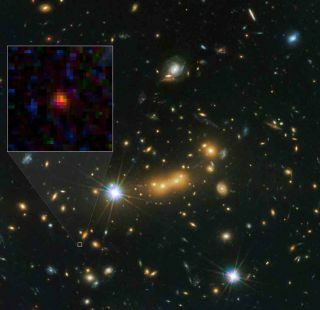 This means we can "see" into space at a distance of almost 13.7 billion light-years. However, astronomers are not sure if our universe is the only universe that exists. This means that space could be a lot bigger than it appears to us. Most of space is relatively empty, meaning that there are just stray bits of dust and gas inside of it. This means that when humans send a satellite to a distant planet, the object will not encounter "drag" in the same way that an airplane does as it sails through space. The vacuum environment in space and on the moon, for example, is one reason that the lunar lander of the Apollo program looks so odd-shaped — like a spider, one crew said. Because the spacecraft was designed to work in a zone with no atmosphere, there was no need for smooth edges or an aerodynamic shape. While space may look empty to human eyes, research has shown that there are forms of radiation emanating through the cosmos. In our own solar system, the solar wind — made up of plasma and other particles from the sun — permeates past the planets and occasionally causes aurora near the Earth's poles. Cosmic rays also fly through the neighborhood, emanating from supernovas outside of the solar system. One large feature of space that is poorly seen or understood is the supposed presence of dark matter and dark energy, which are essentially forms of matter and energy that can only be detected through their effects on other objects. Since the universe is expanding and accelerating in that expansion, that is seen as one key piece of evidence for dark matter. Another is gravitational lensing that occurs when light "bends" around a star from a distant background object. Smaller black holes can form from the gravitational collapse of a gigantic star, which forms a singularity from which nothing can escape — not even light, hence the name of the object. No one is quite sure what lies within a black hole, or what would happen to a person or object who fell into it – but research is ongoing. An example is gravitational waves, or ripples in space-time that come from interactions between black holes. This was first predicted by Albert Einstein at the turn of the last century, when he showed that time and space are linked; time speeds up or slows down when space is distorted. As of mid-2017, the Laser Interferometer Gravitational-Wave Observatory (LIGO) Scientific Collaboration has announced three black-hole interactions and mergers detected through gravitational waves, in just two years. The team found these three events in about two years, indicating that when LIGO is implemented at full sensitivity, the observatory may be able to find these sorts of events frequently, scientists said in May 2017. Should a bunch of these black hole events be detected, it could help scientists learn how black holes of a certain size (several tens of sun masses) are born, and later merge into new black holes. Stars (like our own sun) are immense balls of gas that produce their own radiation. They can range from red supergiants to cooling white dwarfs that are the leftovers of supernovas, or star explosions that occur when a big one runs out of gas to burn. These explosions spread elements throughout the universe and are the reason that elements such as iron exist. Star explosions can also give rise to incredibly dense objects called neutron stars. If these neutron stars send out pulses of radiation, they are called pulsar stars. Planets are objects whose definition came under scrutiny in 2006, when astronomers were debating whether Pluto could be considered a planet or not. At the time, the International Astronomical Union (the governing body on Earth for these decisions) ruled that a planet is a celestial body that orbits the sun, is massive enough to have a nearly round shape, and has cleared its orbit of debris. Under this designation, Pluto and similar small objects are considered "dwarf planets," although not everyone agrees with the designation. After the New Horizons spacecraft flew by Pluto in 2015, principal investigator Alan Stern and others again opened up the debate, saying the diversity of terrain on Pluto makes it more like a planet. The definition of extrasolar planets, or planets outside the solar system, is still not firmed up by the IAU, but essentially astronomers understand it to mean objects that behave like planets in our neighborhood. The first such planet was found in 1992 (in the constellation Pegasus) and since that time, thousands of alien planets have been confirmed — with many more suspected. In solar systems that have planets under formation, these objects are often called "protoplanets" because they aren't quite the maturity of those planets we have in our own solar system. Asteroids are rocks that are not quite big enough to be dwarf planets. We've even found asteroids with rings around them, such as 10199 Charilko. Their small size often leads to the conclusion that they were remnants from when the solar system was formed. Most asteroids are concentrated in a belt between the planets Mars and Jupiter, but there are also many asteroids that follow behind or ahead of planets, or can even cross in a planet's path. NASA and several other entities have asteroid-searching programs in place to scan for potentially dangerous objects in the sky and monitor their orbits closely. In our solar system, comets (sometimes called dirty snowballs) are objects believed to originate from a vast collection of icy bodies called the Oort Cloud. As a comet approaches the sun, the heat of our star causes ices to melt and stream away from the comet. The ancients often associated comets with destruction or some sort of immense change on Earth, but the discovery of Halley's Comet and related "periodic" or returning comets showed that they were ordinary solar system phenomena. Among the biggest cosmic structures we can see are galaxies, which essentially are vast collections of stars. Our own galaxy is called the Milky Way, and is considered a "barred spiral" shape. There are several types of galaxies, ranging from spiral to elliptical to irregular, and they can change as they come close to other objects or as stars within them age. Large groups of galaxies can form in clusters that are groups as large as hundreds or thousands of galaxies bound together gravitationally. Scientists consider these the largest structures in the universe.